Happy Friday and thanks for taking the time to visit the Great Impressions Stamps Blog. We are having some very cold weather here in Pittsburgh and an ice storm is expected today. So when the weather doesn't cooperate for outside activities-you stay inside and craft. All the outside stuff can be viewed from the windows (lol)!! My card for today is one that took me out of my comfort zone. I don't usually make vintage or distressed cards. But this beautiful "Romantic Collage H147" image from Great Impressions was calling for that. I am happy with how the card turned out. I decided to do an embossed resist technique. Stamped the image on ivory cardstock in Versamark ink and embossed with white embossing powder . This part will resist the other ink used. My background is sponged with 2 shades of pink inks. I re-stamped the post mark and the woman image again in the darker pink and fussy cut for a little background interest. I added a die cut key. 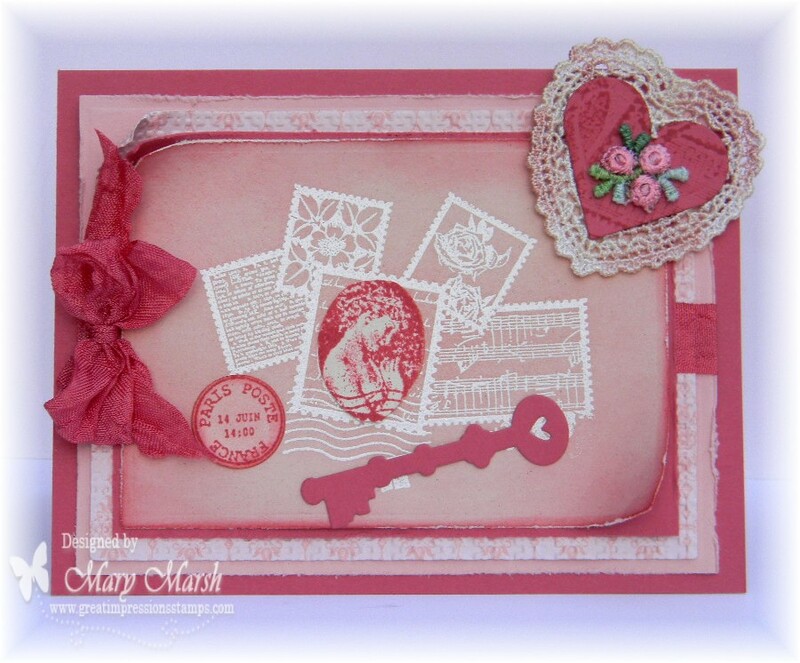 In the corner, I used a crocheted heart from my stash and die cut a heart in primrose petals cardstock and stamped the music part of this image on that. I made a bow with some wrinkled seam binding from my stash. Pulled out my distressing tool to distress the cardstock edges as well as to curl up the corners. Great card. Isn't it funny that you never notice a stamp until someone uses it on a card. Thanks for sharing. Keep warm. This is so pretty and romantic!